This All-Clad Copper-Core 4 quart sauce pan with lid & loop combines complete heat control for superb cooking performance with easy-clean interior and exterior surfaces. Effortlessly cook rice and beans, or create a tangy BBQ sauce for ribs. Hands stay safely away from hot cooking surfaces with the long, stay cool handle. The added loop on the pan provides additional support when draining liquids, or lifting the pan from its cooking surface. The All-Clad Copper-Core sauce pan heats faster than any other All-Clad style because of its inner copper layer. This fast-heating copper core is sandwiched between two layers of stainless steel. The cooking surface is 18/10 non-reactive stainless steel. 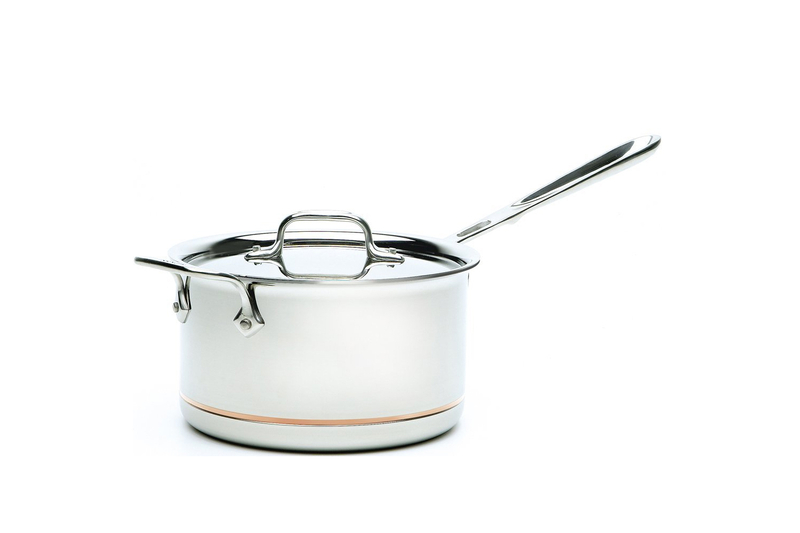 The external side of the cookware is magnetic stainless steel to make All-Clad Copper Core induction compatible. You'll cook with the best possible heating speed, consistency and control because all 3 layers of metal extend across the bottom and up the sides of each Copper Core pan. The exterior copper band design is so distinctive you'll want to display your Copper-Core cookware. Fully-clad All-Clad Copper Core cookware is made in the USA. Slightly rolled rim edges reduce drips and make pouring easier. Flavors stay true with the 18/10 stainless steel cooking surface. This quality metal is not reactive to acids or alkalies, so foods don't pick up metallic tastes. Dishwasher safe. MetroKitchen recommends hand washing your Copper-Core cookware. Steel wool, scouring pads and bleach-based cleaners not recommended.